The hotel is unique in Central Europe, Heviz Spa Lake is located right next to where the cure or the joints, and to treat rheumatic complaints and to choose our hotel to spend their rehabilitation period. Or just spend a pleasant weekend, rest and relaxation in our welcome. 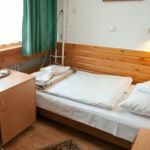 Majerik Hotel *** single or double beds, a balcony, a well-equipped rooms provide relaxation. Our hotel has 12 single and 33 double rooms and 6 apartments. Restaurant and cafe offers a pleasant, intimate conversations, meetings with the best. Our services ensure your comfort and convenience in the repertoire, sauna, solarium, hydromassage spa crystal, a conference room and fitness room. Every year, more famous performers call our events to ensure our guests a carefree recreation and entertainment opportunities. Our hotel's garden is a pleasant few minutes walk to the spa. Medical services include a Chinese natural medicine, massage use. The rating of Majerik Hotel Hévíz is 9 from the maximum 10, 361 based on actual and valid guest ratings and reviews. "Tiszta és tágas volt az apartman, és közel volt a fürdőhöz." "A szobában az ágy matraca kényelmetlen volt." As a gift to Revngo.com bookers: You may arrive at the accommodation 1 hour(s) earlier than the general policy would allow. 84% of the guests would recommend it to their friends!